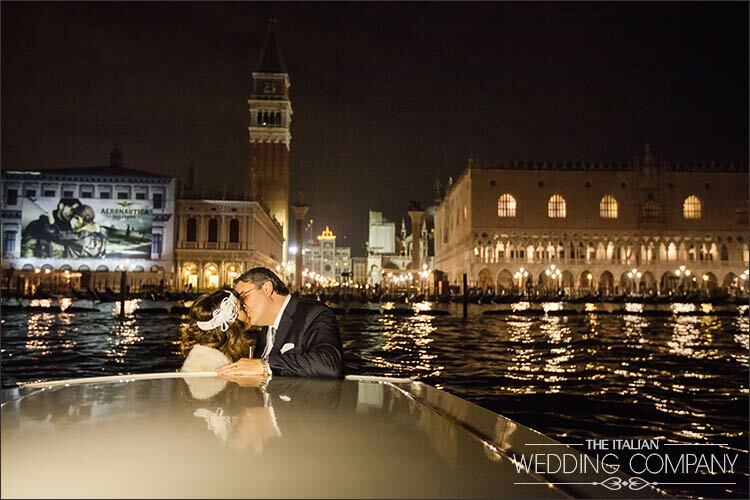 Venice is the city of all lovers! 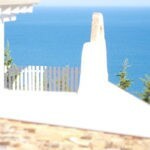 It is without a doubt the ideal place to be seduced by exquisite beauty. Venice is the place of love and mystery, a place where senses lose all rationality in a setting created over centuries and pervaded by magic. Venice has an unique and unforgettable atmosphere even today. 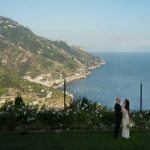 If you really want your wedding to be an inimitable and unforgettable event for you and your guests then treat yourself to a romantic visit to Venice for such a special occasion. 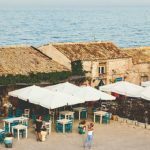 Museums, little squares full of character between Venetian magnificent buildings, winding lanes known as calle, bridges, works of art on every corner of the city will fascinate you and make your stay a one-off experience. And what about crowning your love dream just here? 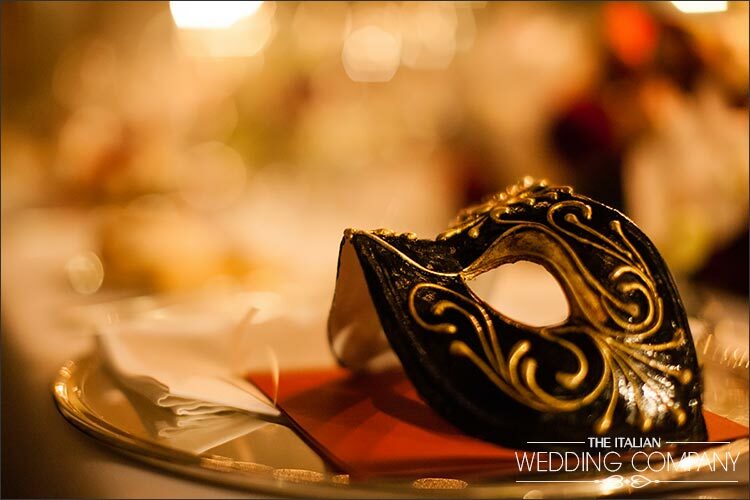 Whether you are looking for an intimate, romantic ceremony or a gorgeous setting for an unforgettable party, Venice is the place you are looking for. 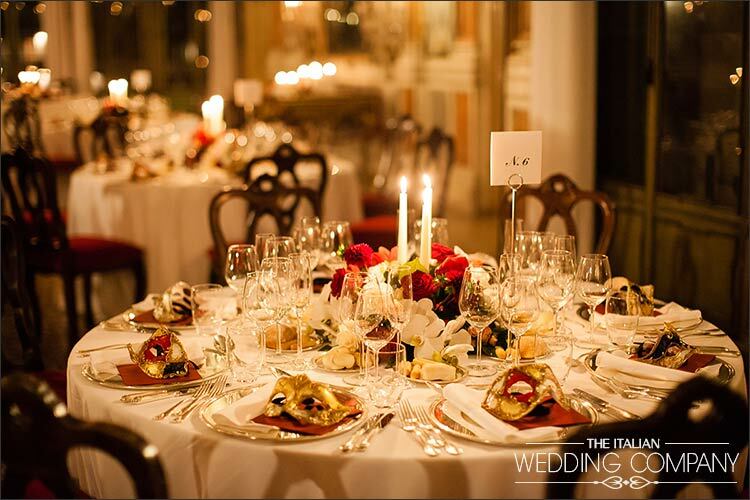 With its timeless charm, Venice is just perfect and it will find it’s way into your soul forever. 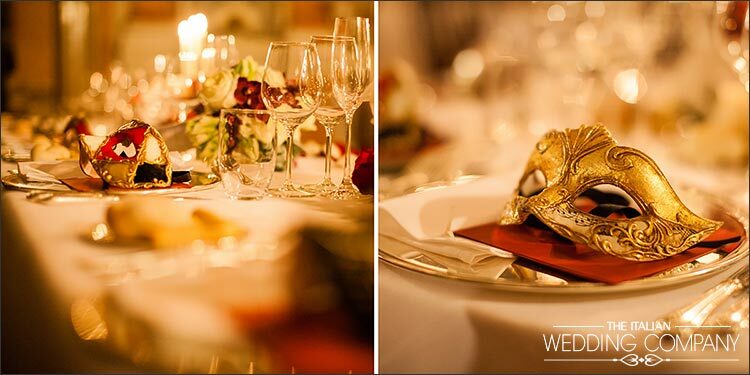 Venice will transform your event into a unique and marvellous memory. 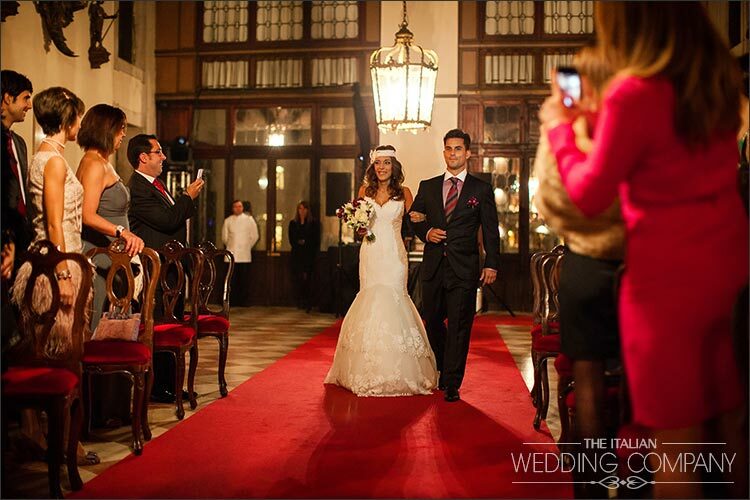 Jesus and Lorea, a wonderful Spanish couple, chose magical Venice for their fairy-tale wedding. 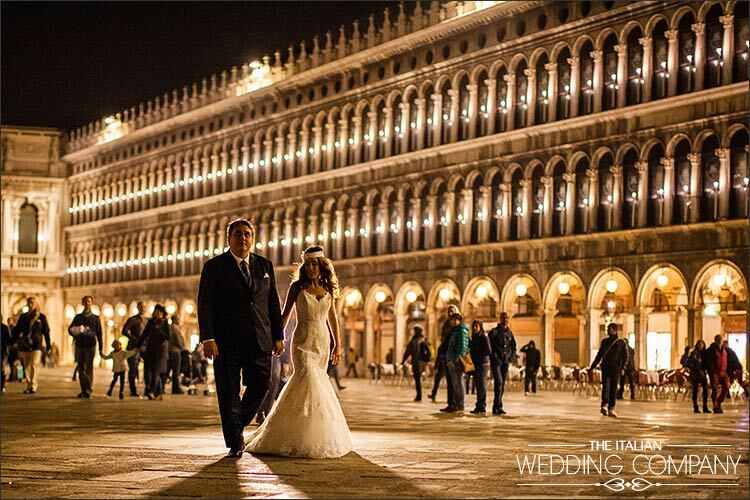 Without a doubt, Venice is destination with its own charisma. It’s magic enchants in any season. 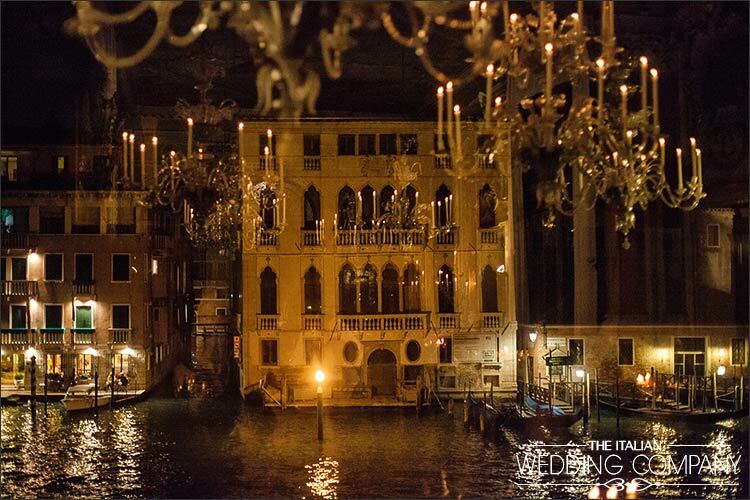 Even during the winter months Venice can create a rich evocative atmosphere. 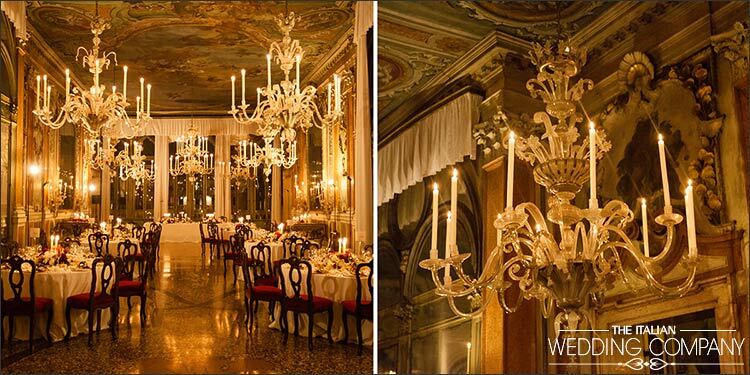 Venice is worldwide renowned for its magnificent palaces that line the banks of its romantic canals. 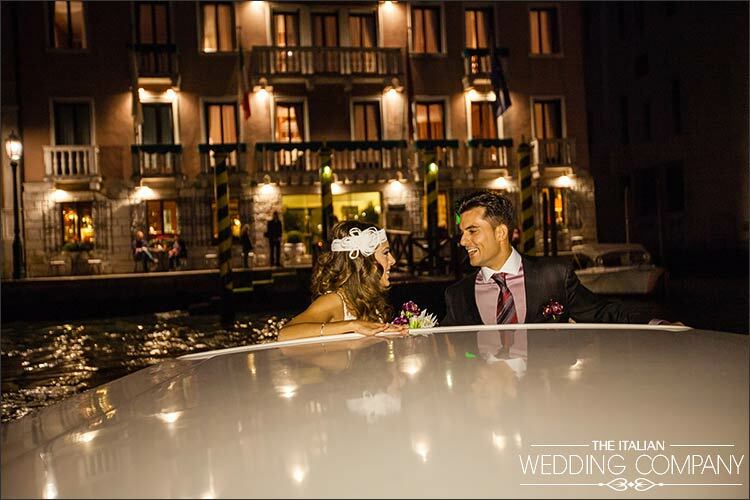 The most famous is The Grand Canal. 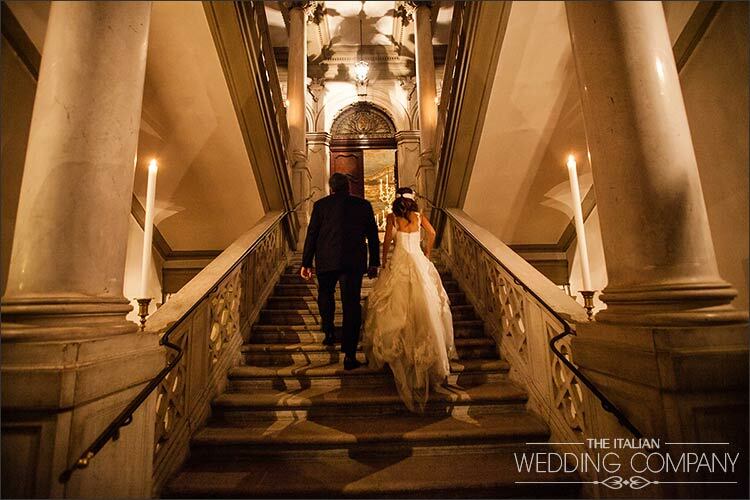 Along it all the most beautiful buildings of the centuries-old Italian nobility lay. 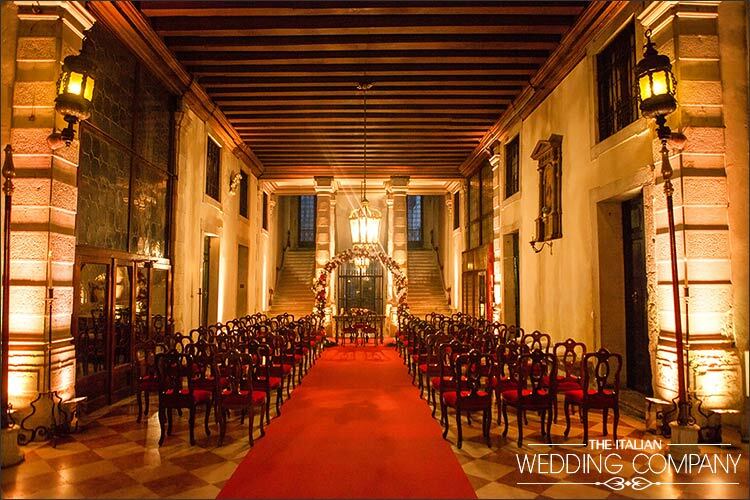 Jesus and Lorea chose one of these amazing palaces as their preferred wedding venue for an intimate and romantic wedding with their close family and friends in Venice. 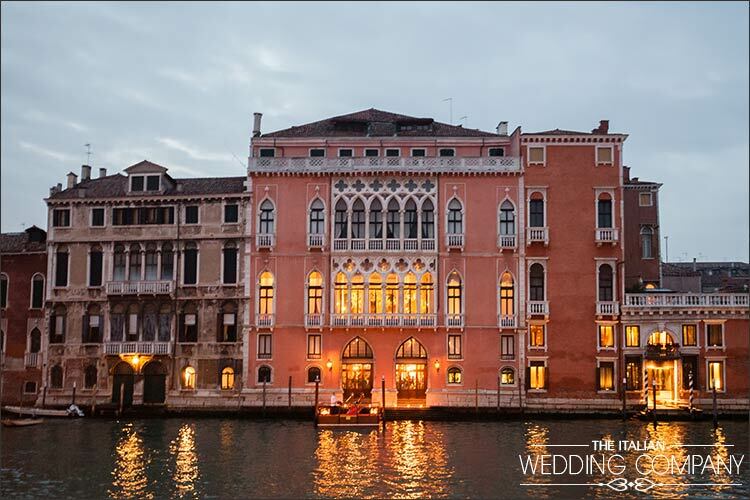 An elegant hotel on the other side of the canal was the the base where everybody got ready and took a motorboat to reach the wedding venue. It was garnet red themed wedding. 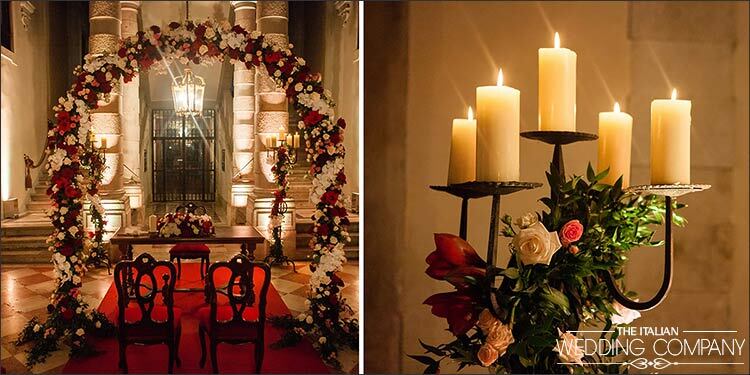 From the bride’s bouquet through the antique red velvet seats and the arch of flowers beautifully positioned in the elegant salon. 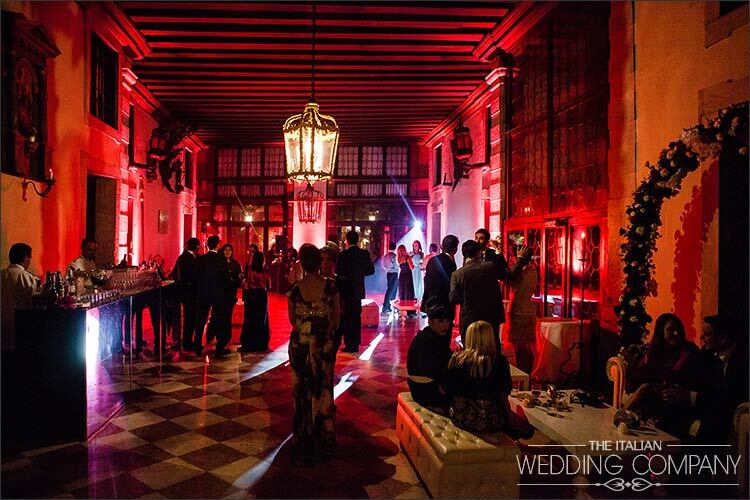 Every detail was highlighted with the colour of passion for this Spanish wedding in Venice. Just at dusk a line of gondolas waited at the private pier of the palace to take all guests on a romantic tour of the of Venetian canals. Simply magic! 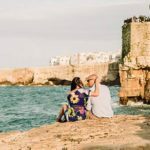 In the meantime, the newlyweds took some time for themselves heading off on a speedboat that allowed them to capture some special and beautiful shots of their unforgettable day. Once back Jesus and Lorea and their guests made their way downstairs for an aperitif. 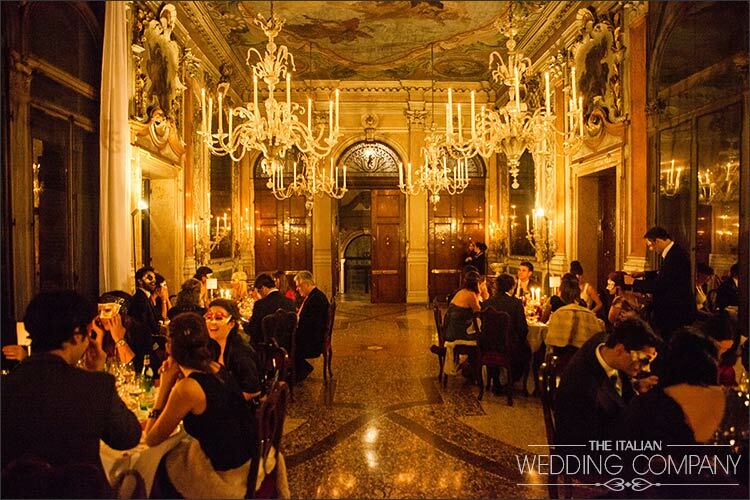 Then back upstairs to the marvellous dining salon for the wedding banquet. An incredible and unforgettable experience for for all. 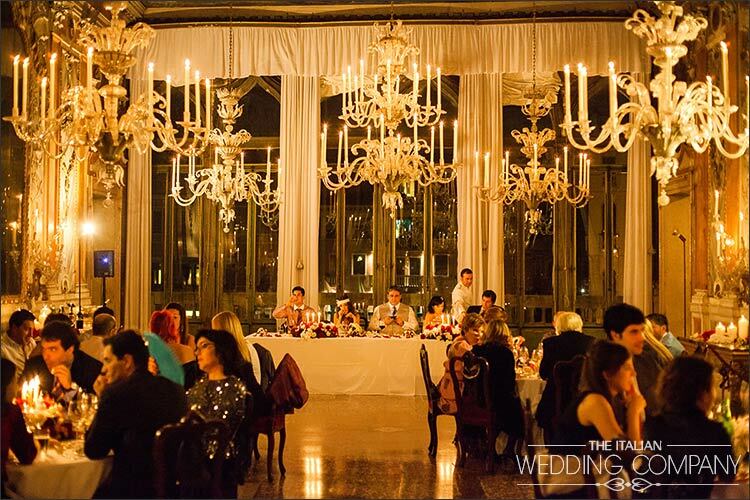 The entire salon was lit by stunning Murano chandeliers of 1600. Not even a light bulb in sight – only candlelight, creating the most incredible and remarkable atmosphere ever seen. 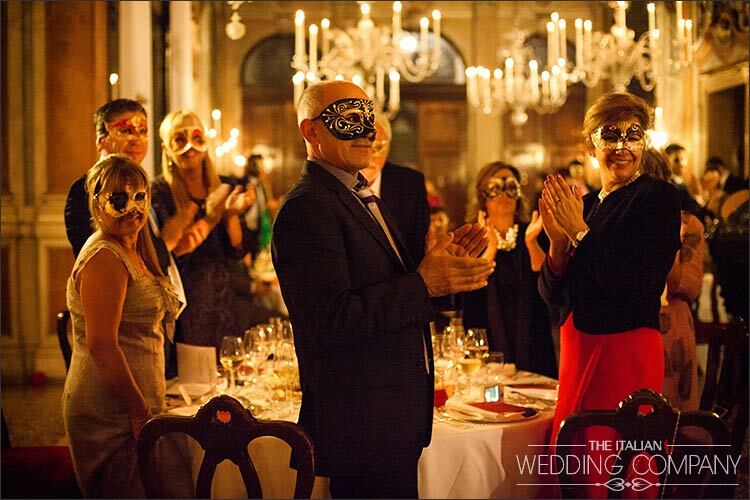 As their seat each guest found a Venetian mask. Each one different from the others. A traditional symbol of Venice with its famous carnival folklore. 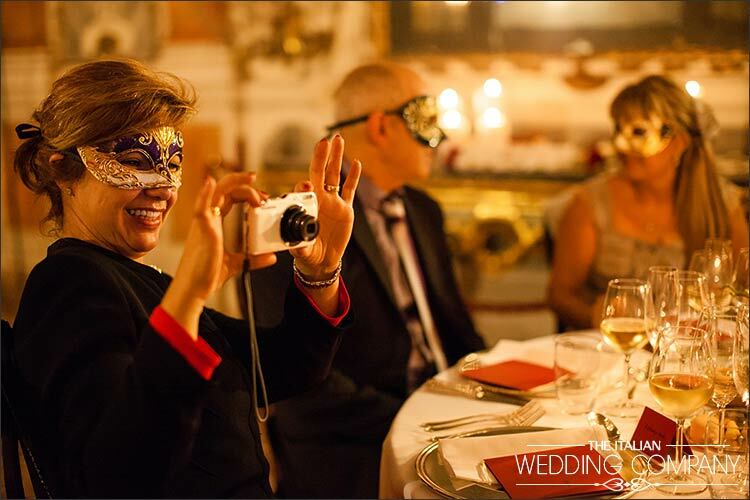 Venetian carnival has ancient roots, it takes place every February – a unique experience that everyone should see at least once in their lifetime. 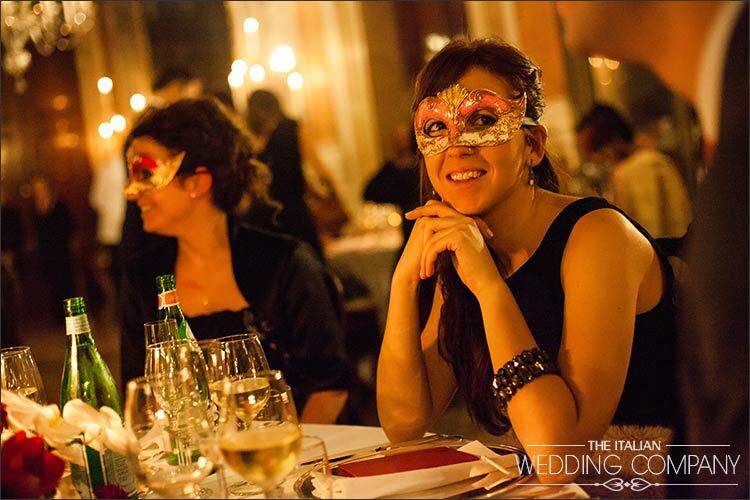 Particularly if you have the opportunity to participate at one of the amazing masked balls that are organised in the luxurious Venetian palaces just like 4 centuries ago. We will come back soon talking about this special event in our posts. 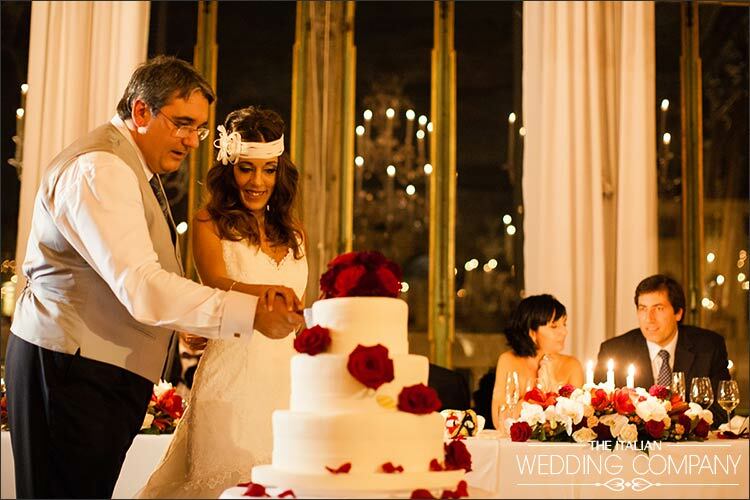 After this cutting of the wedding cake, newlyweds and their guest got back to the ballroom on the water’s edge. It had been turned into a disco for everyone to dance the night away! 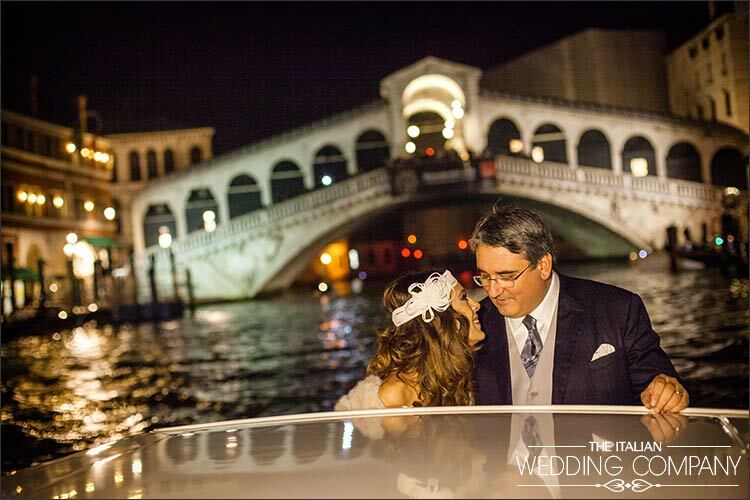 The little pier on The Canal Grande provided a perfect spot for a breath of fresh air and to enjoy a romantic Venetian moon. 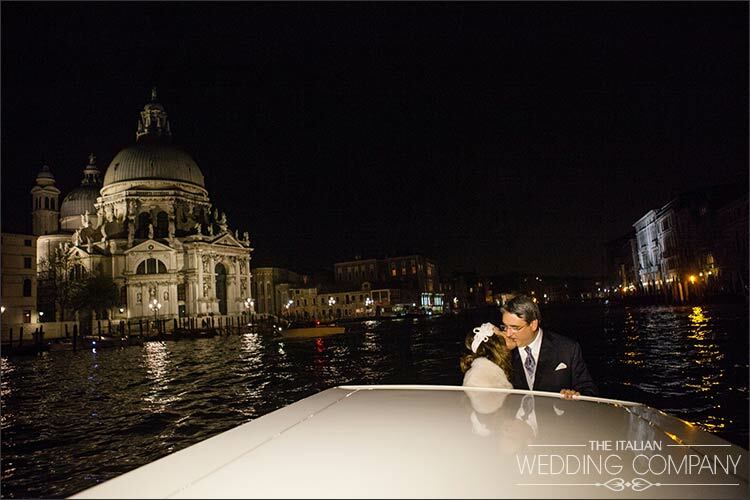 At the end of the party, all guests made their way back to their hotels in true Venetian style: by water taxis that were waiting for them outside at canals’ edge. 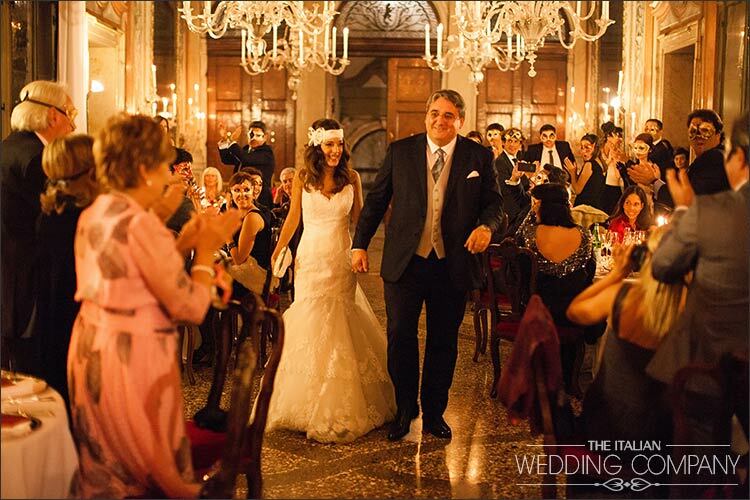 For any information about your True Venetian Style Wedding in Venice please CONTACT US. 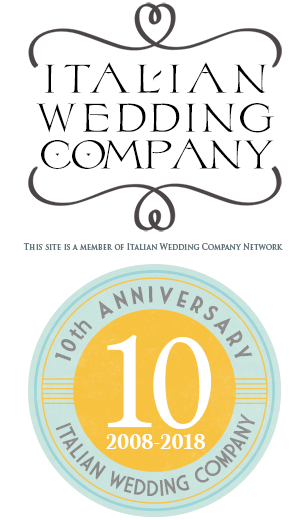 A special thanks to the talented Daniele Borghello of Morlotti Studio in Venice for the beautiful images. 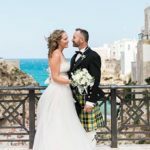 Intimate wedding for 2 .